As my love of sheet masks continues to grow, I find myself more and more interested in the different types of materials that are used to make them. One of the latest on the market is from the new brand, Kore Beauty, who use hydrogel to make their masks. I've been putting some of their Anti-Ageing masks to the test to see how they compare to traditional cotton based sheet masks. 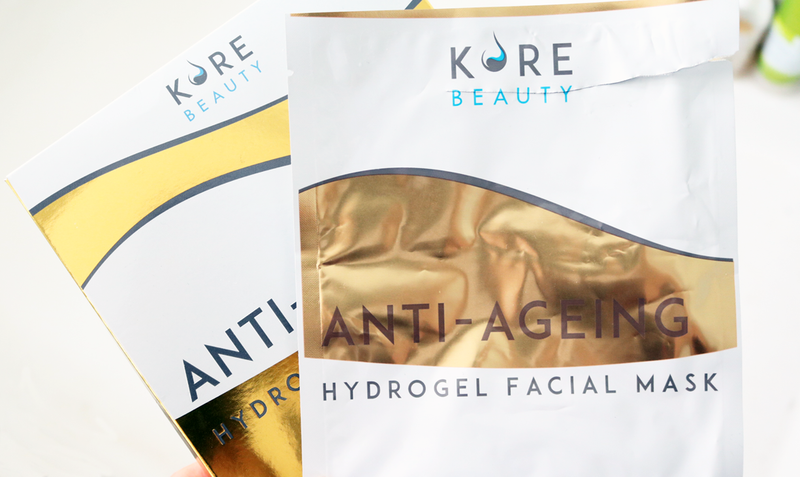 Kore Beauty's Anti-Ageing Hydrogel Facial Mask has been specially formulated for skin that's started to show the first signs of ageing. It claims to help reduce the appearance of fine lines and wrinkles, whilst balancing moisture levels and improving the elasticity of the skin to keep it supple for more youthful-looking skin overall. The mask also helps to stimulate cellular repair, boost collagen production and improve skin tone. What's the difference between hydrogel and cotton/pulp sheet masks? This mask is made from hydrogel which means that the ingredients/formula are actually formed into a hardened gel-like substance to create the hydrogel itself - thus becoming the mask (there's basically no middle man!). This is different to cotton or pulp-based masks which have the formula/ingredients soaked into the mask's cotton or pulp-based material. Due to this, hydrogel enables a much closer contact between the mask and the skin because there's no other material in the way, which allows for better penetration of the ingredients (and also explains why hydrogel masks are more expensive than cotton based sheet masks). The three key ingredients in this mask are Retinol, Hyaluronic Acid and Vitamin E. Retinol (the technical name for Vitamin A) is a great ingredient to have in anti-ageing skincare as it's been clinically proven to help reduce the appearance of fine lines and wrinkles, improve the texture and appearance of the skin and help to firm it up. If you're new to using Retinol, it's best to use skin care that has it in at night, and to make sure that you use a good quality facial sunscreen during the day, as it can make your skin more sensitive to sunlight. Hyaluronic Acid is amazing for plumping up moisture levels on a deeper level and Vitamin E is a powerful anti-aging antioxidant. Application and how often do I use this mask? To apply, open the sachet and carefully take out the mask. It's VERY wet, so I did this over a sink. The mask is in two parts which makes it quite fiddly and tricky to pull apart, but I got there in the end! I applied it to a clean and dry face and noticed that it fitted really well. The hydrogel has a lovely cooling soft gel texture, and I noticed that it clings to the skin much better than cotton sheet masks do - there's no sliding around or falling/peeling off. The nose part was a little big on me, but other than that I thought it was great! I left the mask on as instructed for 30 minutes. Kore Beauty recommends using this mask once a week for the best benefits. After the 30 minutes were up, I took the mask off and massaged in any remaining essence - there wasn't a lot left to be honest, as my skin had pretty much absorbed it all. Looking in the mirror, my skin was mildy red due to the Retinol, but it didn't feel irritated or uncomfortable. The redness soon subsided, and my skin was left looking much more awake and refreshed. I don't have any wrinkles yet, but I do have some fine lines around my eyes, and I noticed that these had been completely smoothed out. The biggest difference for me was how soft and plumped up my skin felt, it was super smooth and looked much brighter. 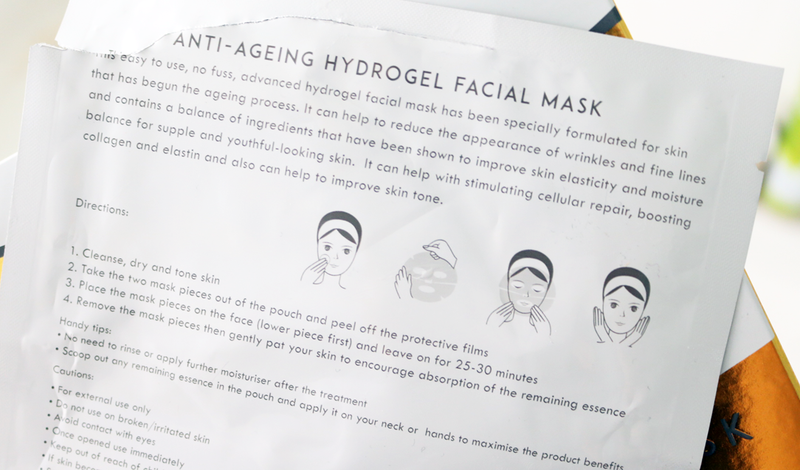 I'd definitely use this mask again for when I need a quick fix for a special occasion, and I do think the ingredients absorb better thanks to the hydrogel! Have you tried any hydrogel sheet masks?